Three of our YES alumni 2017, Melia, Sukma and Widi are awarded a Bhakti Indonesia scholarship, full scholarship education at one of the universities in Jakarta. 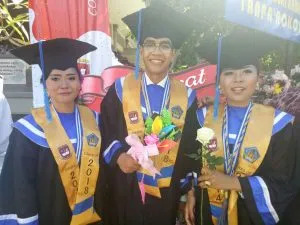 Ni Putu Sukma Ariyanti was accepted in Business Mathematics, Ni Komang Melya Lestari was accepted in the event, and I Made Widi Yudiatmika was accepted in International Business Law. Moreover, I Made Widi became the best graduate in Bali Mandara school. Success for the YES Alumni who will continue their education in college, hopefully, they gained more knowledge!